All of us have been part of an organization that needs to change. Seeing or knowing that change is necessary isn’t the same as being able to undertake the initiatives that will help address key issues, improve performance, and allow the organization to seize new opportunities. We have also faced resistance to change in our nonprofits. Someone suggests something new or different and, if we’re honest, even we have been reluctant to go along. Change means giving up on what you’ve always done in order to test something that might fail. So what do you do? How do you help an organization embrace change? While not simple, there is a manageable five-step process that will help you manage the change so that it doesn’t manage you. This step is where you break up with the idea that you can “keep on keepin’ on” and do what you’ve always done while expecting different results. 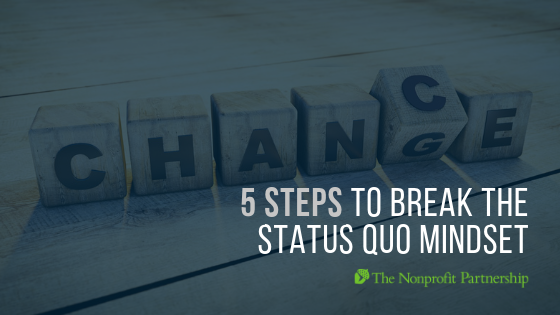 Your organization may never have thought about the need to change, or only fleetingly, but entry is the time to start understanding that status quo is no longer an option. What do you do in this step? One thing: you work with the right folks – staff and volunteer leadership to identify the need for change. You’ll need to think about how you are initiating these conversations – when? with whom? what’s the format? – and might want to bring in a facilitator to help get through some of the stickier points. Diagnosis consists of communicating your need for change with your external and internal stakeholders through data gathering. You’ll want to conduct interviews, focus groups, online surveys, and maybe other data collection methods particular to your organization. They key here is to gather information from a diverse group of stakeholders – donors, Board members (past and present), staff (past and present), alumni, partners, competitors (or peers), and others who are affected by or connected to your mission. Request both qualitative and quantitative feedback and vet your questions carefully to ensure that the question you ask will gather the information that you want. You have data! Now what? In my experience, this is where most change management processes fail because once you have data, you need to also have a commitment to do something with it. Once you have your data you need to meticulously review and analyze the data to let it inform your actions and how to address the gap between your current and desired states. You’ll receive an intense amount of feedback, and so it’s best to break it down into manageable chunks. What are the themes for programs? Fundraising? Governance? Infrastructure? Staff? Culture? Communications? Other categories specific to your organization? Start with themes by category and planning the appropriate actions will become easier to identify. You have your plan and you are ready to put it into action. First things first: who is going to get you through your plan? What coalitions do you need to build? What teams do you need to mobilize? Now it’s time to build cross-functional teams that will help you build broad support from a larger group of constituents. Take the time to talk to your stakeholders about what the data revealed and about where you are going and how they can help. Once your coalitions are built, it’s time for action. Intervention is just another word for immersing yourself in the change. Before you dig into your action plan, don’t forget to identify where you think roadblocks might occur so that you can anticipate a response. Start to slowly work your plan using the teams that you’ve built. Don’t forget to build in short-term wins that will help energize your change teams and keep pushing them forward. Change is never finished. But there are points at which it is important to pause and evaluate. Evaluation provides critical feedback as you learn how to maintain change and sustain the new methods that you have put into place. Revisit your action plan and strategies regularly to build change into the fabric of your organization. While all organizations facing change need to follow these phases in some form, you’ll need to tailor your approach to your particular type of organization. For a long time, organizations have searched for the key to stability: a stable workforce, stable revenue, a stable volunteer and donor pool. Stable is just another word for safe, unvarying, solid. But in an ever changing and ever more complex world, stability is not only difficult, but imprudent. The most successful organizations, especially nonprofits, need to change regularly. Organizations that succeed embrace rapid change, are willing to hang out in the messiness that IS change and are able to sustain it because they have an organizational focus on change management and are agile, adaptive and resilient. As you go through the five critical steps for change, the most important piece of advice I can give you is to be proactive, not reactive. Remember that change management is indeed a process so it behooves you to think in advance about the entire five-step framework and map out your intended plans in advance. Something to know: even if you are ready to embrace change in the right way doesn’t mean that it will be sustained. Unfortunately, the odds are stacked against you. Change efforts fail up to 70% of the time. This sounds daunting, I know. There is no silver bullet for success in change management. When in doubt, slow down, secure engagement, and collaborate to develop the right strategies for your organization.